“Let There Be Matter” is Rita Miglioli’s third exhibition at the Faculty Club. The first, in 2011, was titled “Immaterial,” and the second, titled “Material Splendor,” was in 2014. The exhibition “Let There Be Matter” comprises a group of works in different media and various techniques. To explore the subject Miglioli allowed herself style flexibility and freedom of technique. 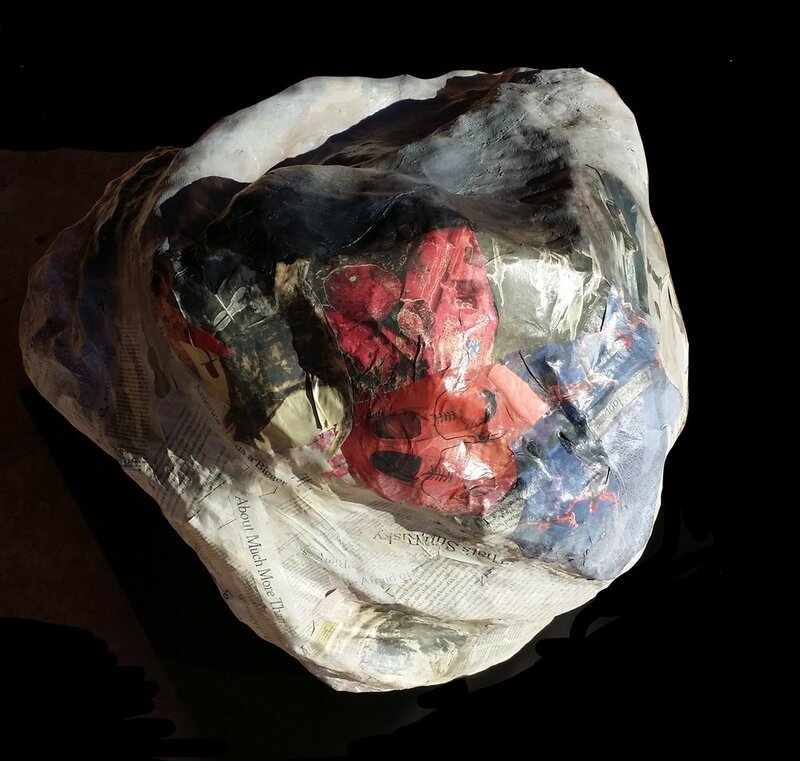 By painting, sculpting, making videos, and using newspaper clippings, she presents a multifaceted, beautiful and meaningful argument. 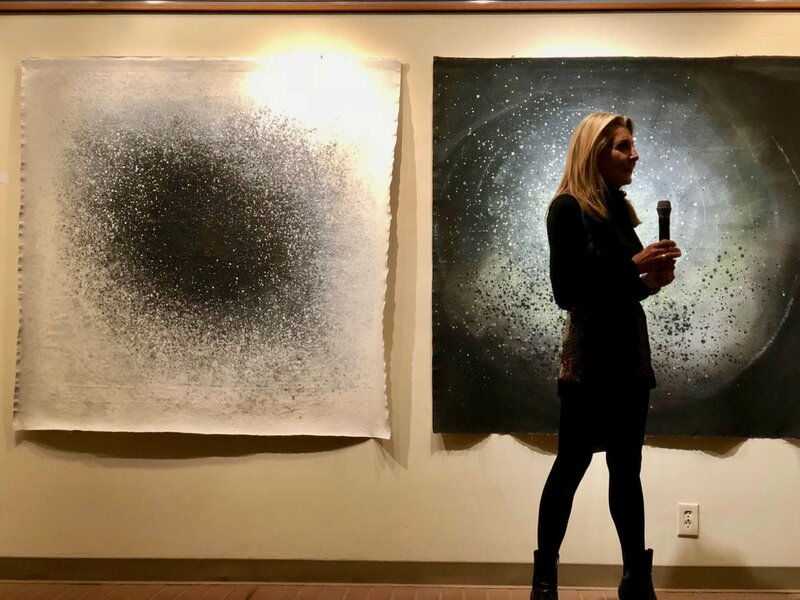 In 2011, inspired by scientific writings, she began saving newspaper clippings and photographs that caught her attention, and she began painting cosmic related images seen in books and associating them to her abstract and intense visions. While always looking to create interesting artistic compositions, she discovered the truer connection among materials and subjects. 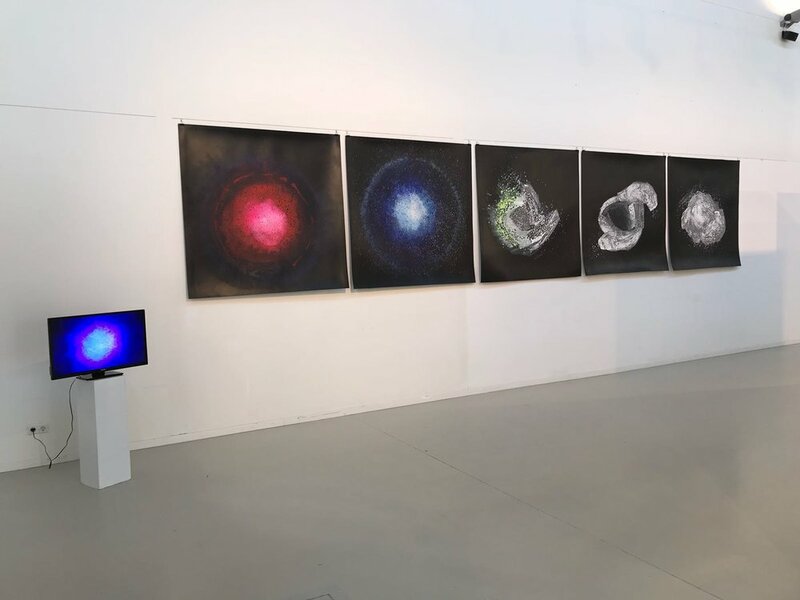 The works in this exhibit reflect Miglioli’s discovery of a process through which her interest in cosmic phenomena, and her prolific imagination, and emotional insight, Miglioli clarify the essential content of her art. She has been dealing with three large, recurrent topics: how we got here, who we are, and where we go when we’re done. Or, to put it in grander terms: cosmology, psychology, mortality. And the exhibition “Let There Be Matter” stems from all three of these themes expressed through paintings, sculptures and mixed media. Among the works in this show is a series of large star-or planet-like images in acrylic on unstretched canvas. “Cosmic View” (2018) is a very large painting done on a very light, light as air, closed cell foam material. It represents an explosive universe full of amazing possibilities, or Where we come from. The exhibit also includes a video display that echos the creation of matter seen as slowly changing lights. “Matter and Light” (2017) is a video Miglioli made by projecting pulsating bright lights on a painted background to simulate explosion, fusion and creation, or How we got here. The three-painting series “Far From Now” (2018) addresses human evolution, scientific progress and its unpredictable future, or How we got here, where we’re going. “True Nature” (2017) shows human desire to identify with nature: its perfection, its beauty, its soul. We are part of nature, but we are—perhaps as far as we know—the only part of nature able to actually appreciate it. This is the essence of Who we are. “Outbound Fragment” (2018) is an asteroid-like sculpture created from wire, plaster and newspaper clippings, as if random events were captured in solid form and projected into space to be found by—who knows? If life on this Earth arrived via an asteroid, perhaps our existence may be similarly projected into the void, with unknowable results. The simulated rock also depicts a kind of cultural DNA of our world’s issues, witnessing human existence when projected outward into the future and backwards into the unknown universe. “Outbound Fragment” is emblematic of the many possibilities and questions that remain without answers. Rita Miglioli - Does matter begin—and if it ends, where? Out of synch with measured time, there and here, forward and back, collapsing and expanding, curving and vibrating, appearing and disappearing, atoms continuously renegotiate their form in a sequence of granular quantum events. The works in “Matter and Light” are a glimpse of the spectacle of these forces at play. In principio era il NERO. Un buio assoluto prima del fatidico big-bang, come ipotizzato dalle odierne teorie scientifiche. In seguito una condizione relativa legata alla privatio lucis, al nero fenomenico di ciò che rimane in ombra. Si parla, dunque, in un imprecisato quanto remoto punto della Storia e del Tempo, di “creazione partendo dal nero”. La mostra, ideata dalla galleria JELMONI STUDIO GALLERY, focalizza l’interesse della ricerca e della selezione sull’arte contemporanea emergente, dalle differenti e poliedriche forme espressive, rappresentata in una varietà di generi senza restrizioni: dalla pittura alla scultura, dalla fotografia alle proiezioni che trovano spazio in una struttura davvero particolare. Il CBK Amsterdam è un luogo d’incontro, dove l’Arte contemporanea è centrale. Inizia e facilita le attività per un ampio pubblico e lavora con organizzazioni, scuole e artisti per rendere accessibile l’Arte. Con una variegata programmazione, il CBK contribuisce ad un clima culturale attraente ad Amsterdam e nei dintorni. È nel cuore del distretto culturale delle Arti, al centro di una serie di realtà dedicate alla ricerca e all’innovazione. Il CBK confluisce nella rete culturale collaborando con numerose Istituzioni e Accademie, al fine di promuovere e stimolare il dibattito sulla cultura del contemporanea. The works in the “Weightlessness” series employ gauze as bas-relief material, and along with acrylic paint on canvas, enact an imaginary stage performance, where the painterly materials become destabilized and transition from substance into an undefined image, or from an undefined image to substance. The fabric is attached to the canvas to provide tactile texture, and depth. The interesting thing about gauze is that although it is made of natural coarse cotton it is soft to the touch, and its weave is open enough for the eye to see through it. When used in layers, gauze is perceived as a thick presence, but in a single layer it seems transparent. It can play different roles: it triggers discordant perceptions about its true substance, and it gives altered readings of the same substance. When rigid interpretation dissipates to become a flexible understanding unrestricted by predjudice or viewpoint,, the essence of being is restored, and so are all of its intrinsic values. There is no need for description, no need for words. Perhaps essence, the core of everything, is simple, clear...weightless. There is a flourish, a tumultuousness, in Rita Miglioli's work that belies her paintings' careful construction. Seen from a distance, her ephemeral swirls of paint and gauze are seriously compelling and dynamic. Comping up close to the surface of her work, the viewer takes in the minutiae of imbricated picture planes and the detailed, feathered edges of her painterly strokes. The great sea-swelling of her vista-like compositions assumes a serenely dream-like quality. It all looks so effortless: a sign of mastery. It is a truism, I suppose, to say that great painting is born out of ultimate freedom as well as necessity and will, yet in Rita Miglioli's case, the visual achievement is undeniable. In 1863, the French art critic Charles Baudelaire asserted in Le Figaro (in one of his seminal essays later collectively titled The Painter of Modern Life) that deepest level of creative activity “is nothing more or less than childhood recovered at will.” Baudelaire continues: “It is by this deep and joyful curiosity that we may explain the fixed and animally ecstatic gaze of a child confronting something new, whatever it may be...a face or a landscape, gilding, colors, shimmering stuff, or the magic of physical beauty.” How apt these observations are in light of artist Rita Miglioli's abstract work, whose “shimmering stuffs” orient the viewer toward an appreciation of the artist's sense of play and control in her work. On one level, in her Weightlessness Series, Miglioli's coloristic and textural interplay constantly evokes a liberation of the image from a narrative or symbolic reading. It essentializes by insisting on the autonomy of the three-dimensional picture plane while evoking without gratuitousness a transcendent realm of pure expression. Yet references to the outside world remain, if tactfully submerged, in the artist's work. Indeed one might even suggest hat Miglioli's forte is the aligning of abstract codes of abstraction and representational possibilities. What is remarkable with Rita Miglioli's palette and mark-making capacity, then is its elasticity, this capacity to cleave to any number of inferences that diverge from non-objective ones, while obstinately staying within the regime of abstraction. For example, references to veiling find their measure in the deep swirls of Miglioli's morphing cascades. Yet the paint material itself is hardly prescriptive at all. In fact it is hardly over-determined in any real sense. On another level, Miglioli sets up the contrasts in her gestural schema where the color and texture deliberately interfere to create a visual resistance to the play of infinite depth. As in many of her strongest works she creates a “dissociation of sensibility” with the ironic lack of relation between background and foreground. The result is a heightened drama of the pure “factness” of her materials that seem to have their own proud volition as the assert the support surface as surface itself. What we see therefore is not exactly what we get in Miglioli's work; we get much more than what we bargained for. We feel contested territory in her work. Optical roller-coaster effects are held in careful balance through the artist's sheer craftsmanship and, importantly, through her judicious cropping and editing. The outer edges of her work are cadenced with exactitude and nuance, allowing the spectator to enter the picture plane through multiple viewpoints. The Weightlessness Series reminds us that the poetry in good abstract painting is in its infinite potential to revitalize its dialog with the viewer, to resist immediate comprehensibility through formal inventiveness. The inventiveness of transcendence that plays itself out so readily in Rita Miglioli's art is particularized through the ambiguities of scale. Scale plays an important role in apprehending sensorially the given object and its gestural components in its given context of origin. Miglioli's textures and spaces create a system of signification through their obstinate conflation of the near and the far, the close-up and the far away, the miniature and the gigantic. It becomes very hard to pin down definitively whether the eye is to place itself at a remove from the painterly action, as if to give it more narrative play, or if we are immersed in action which occurs at a magnified level. In the latter case, the piecemeal and personalized reading permits a greater sensation of mastery and temporality. Analogies between us and our own status within a larger historical or social context will necessarily accrue as a residual reading of this temporal matrix. As I had mentioned earlier, Miglioli's work pulses with vitality through its suggestive interplay between control and spontaneity. In Friedrich Schelling's words, art “reflects for us the identity of conscious and unconscious activity. The basic character of the work of art is thus an unconscious infinity (synthesis of nature and freedom).” Such integrative aspect is at the heart of Rita Miglioli's probing inquiry on the conditions of how we perceive and what we perceive. Because the senses are continually exalted in the artist's paintings, a rare quality of poetic exaltation permeates Miglioli's work, while her aesthetic is in this way raised to new, plastic heights. The paintings in the show, which are mostly acrylic on canvas, use bold colors and abstract forms to illustrate the elemental subject matter. A group of eight smaller paintings highlights the show’s theme, depicting the four elements in splendid colors, where even the earthen browns are enlivened with sparkling streaks gold and silver running through the deep-toned backgrounds. In the same way others turn to treatises, Rita Miglioli is at heart a philosopher who uses the medium of painting to think things through. In this current work, herreflection bears upon specks of the earthly universe, splendidly amplified upon her canvas in their ever-morphing materiality. She creates the vortex that she fears, and to which she abandons herself, at the same time as she tries to master it. She deconstructs the act of painting, along with the canvas that supports it. The four elements of pre-socratic thinkers are evoked yet reconfigured by art – or is it by chemistry’s periodic tables? She decants the process of consciousness and explores elements of herself involved in such a process. The result of this decontrolled drip painting and exhausting self-questioning is Miglioli’s large, spectacular work. It is is equally distributed in appearances of nano-elements and mega-bigbang galaxies. Whilst in layering artwork, she invokes other major abstract artists such as Cy Twombly. The paintings are abstract with glimpses of recognizable forms. They alternate the use of bold reds and warm grays, while some have the deep blues and blacks of the interstellar space in which Miglioli envisions creation and destruction alternating in a creative process. She named the show Immaterial because the word, as she puts it, "expresses the dual nature of life: simple, everyday objects and gestures are material in the sense that we can touch, taste, see and smell, but immaterial in the sense that each thing contains the purity of form and meaning to which it may wish to aspire." For her, "human nature is likewise material in the sense that we live in a physical world and must move, breathe, love, or work, but there is in each of us an immaterial or spiritual component that contains the best ideas, feelings, and deeds of which we are capable." Professor Alain Cohen, VP of the Faculty Club Board and an enthusiast of Miglioli's art, curated the show: “Rita Miglioli’s work is unique as well as engaged in a dialogue with the likes of Cy Twombly and other major contemporary abstract artists. Several of the works she selected for this exhibition address an elusive spacetime and boundary between integrative bas-relief material and the specific painterliness of acrylics. Under our gaze, parts of the painterly-gauzed material become destabilized as she reconfigures the edges which morph from substance into deconstructed evanescence. The brain/mind mysterious chaosmos comes to mind, as does the mesmerizing horizon wherein ocean and sky become harder and harder to delineate." The long fabric panels that I paint, similar to tapestries, help me to achieve the vertical height that I look for. I approach the tapestries in a contemporary way, but trying not to disturb or interfere with their traditional nature. I have always had a fascination for the infinite, and a romantic attraction to the sky, a sort of naive desire to live in it. I use emotional memories of antique windows to symbolize mental perception of time-and-space continuity. The window serves as a visual representation of space— inside the room and outside—and as the perfect means to define, separate, and ultimately connect the two as one indefinite space. Through my abstract or quasi-representational elements I investigate the window as a psychological object as well as a functional, and cultural object. Through the artistic process the object transcends, allowing the exploration of the irrational and creating a trail to the unconscious. As a child I wanted to experience the infinite—its space, its meaning—by pretending to plunge into the sky. I would stand with my feet on the edge of the porch step, leaning back and forth and holding a mirror in my hands, horizontal and thus facing up to reflect the sky beyond the edge of the porch ceiling. While looking down into the mirror that reflected the sky, I would swing back and forth to get the feeling that my body was out of balance and was about to fall into the sky. My mother died when I was seven, and I realized that she was gone forever. The word ‘forever’ became puzzling for me, and unacceptable, and I often looked for ways to find a different meaning. The images I draw come from my emotional memory of places or sensations. I get energy from this thought process because often the images are connected to places that provide a reassuring feeling of time and space continuity. They create a sense of comfort that eases the stress of life’s fragility, and provide an illusion of immortality. Affascinata dall’infinito, ho una romantica attrazione verso il cielo—una sorta di desiderio ingenuo di viverci dentro. I lunghi pannelli di tessuto, simili ad arazzi, che dipingo mi aiutano ad ottenere la verticalita’ che cerco, e seppure li uso in chiave contemporanea cerco di non disturbare, ne’ interferire con la loro natura tradizionale, entrambi elementi di cui ho bisogno. Proiettando emotivamente il mio ricordo di finestre antiche visualizzo la percezione mentale della continuita’ del tempo e dello spazio. Esploro la finestra come un mezzo per misurare lo spazio, dentro la stanza e fuori. La finestra come mezzo perfetto che definisce, separa e infine collega i due spazi in un unico spazio indefinito. Attraverso elementi astratti e quasi-figurativi, investigo la finestra come oggetto psicologico oltre che oggetto funzionale e culturale. Attraverso il processo artistico l’oggetto psicologico trascende permettendomi di esplorare l’ irrazionalita’ e creando il collegamento all’inconscio. Da bambina volevo provare l’emozione dell’infinito—il suo spazio, il suo significato—e fingevo di cadere nel cielo. Mettevo i piedi sull’orlo del gradino del portico, dondolando avanti e indietro e tenendo uno specchio fra le mani, parallelo al pavimento e rivolto in su’ per rispecchiare il cielo che vedevo oltre il cornicione superiore del portico. Mentre guardavo giu’, dentro lo specchio che rifletteva il cielo, dondolavo avanti ed indietro per sentire il mio corpo che sbilanciato sembrava cadere nel cielo. Mia madre manco’ quando avevo sette anni, e mi resi conto che se ne era andata per sempre. Le parole ‘per sempre’ mi turbavano e erano inaccettabili, cosi spesso cercavo la maniera di trovare altri significati. Le immagini che dipingo nascono da ricordi emotivi di luoghi e sensazioni. L’evoluzione di questi pensieri mi carica di energia perche’ spesso le immagini sono collegate a luoghi che procurano un rassicurante senso di continuita’. Danno una sensazione di conforto che attenua la preoccupazione della fragilita’ della vita, e creano una illusione di immortalita’.